But while direct tax collections have grown at a robust 14.5 per cent so far, indirect taxes remained at almost the same level as last year. “The pressure is more visible on the revenue side rather than the expenditure front. To meet FY19 (RE), monthly revenue receipts during January-March 2019 have to be 1.8 times the average monthly collections in the nine months of FY19, which appears difficult to achieve,” noted Devendra Pant, chief economist at Ind-Ra. Under direct taxes, corporate tax collections soared by 14 per cent to Rs 4.27 trillion at the end of December, up from Rs 3.75 trillion over the same period last year, while income tax collections grew at a healthy 15.2 per cent to Rs 3.02 trillion, up from Rs 2.62 trillion over the same period last year. But on the indirect tax side, the situation is grim. Central goods and services tax (CGST) collections stood at Rs 3.4 trillion at the end of December. Add to this, collections in January (CGST and the apportioned IGST) and total collections till January add up to Rs 3.76 trillion. This implies that in the next two months (February and March), CGST collections (CGST and the apportioned IGST) have to add up to Rs 1.28 trillion for the government to meet the revised CGST target of Rs 5.04 trillion, which is Rs 1 trillion lower than the earlier Budget estimates. 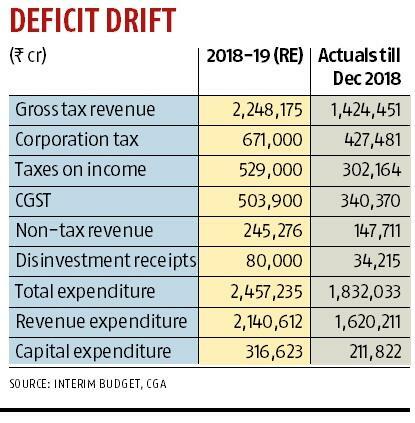 And though non-tax revenues have touched 60 per cent of the budgeted target, disinvestment proceeds stood at Rs 34,215 crores at the end of December as against the target of Rs 80,000 crores. On the other hand, total expenditure was up 7.8 per cent at the end of December, compared to the same period last year. “Ind-Ra notes that the government has some buffer in capital expenditure, the difference in capital expenditure between FY19 (RE) and first three quarters of FY19 is Rs 1.05 trillion translating in average run rate of Rs 34,900 crore, which is nearly 1.5 times of monthly run rate of nine months of FY19,” Pant said. He said capex in FY19 has declined from Rs 31,900 crore in Q1 of FY19 to Rs 24,300 crore in Q2 of FY19 and further to Rs 16,400 crore in Q3 of FY19. Assuming capex in the fourth quarter to be the same as the third quarter of the year, the government has a buffer of Rs 55,600 crore to take care of any revenue shortfall, he added. The subsidy bill (major areas) has already reached 93 per cent of its budgeted target of Rs 2.64 trillion at the end of December, with the food subsidy bill touching 96 per cent of its budget target. “With limited scope to cut committed expenditure, attaining the revised fiscal deficit target of 3.4 per cent for 2018-19 would be contingent on the reversal in the shortfalls in the indirect tax proceeds (GST) and targeted disinvestment receipts being collected in the last quarter,” a report by CARE ratings noted. Given that economic activity is high in the last quarters, tax collections are likely to be higher compared to previous quarters. 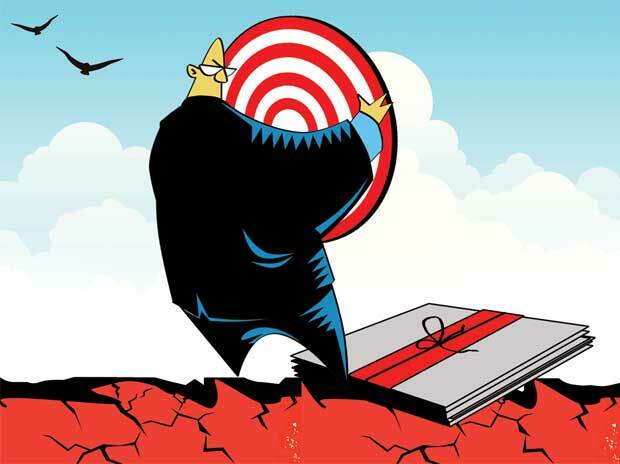 LIC could come to the aid of the government to meet the disinvestment target, the report said. There could be some rollover of expenditures to accommodate the cash transfer programme of Rs 20,000 crore for this year, it added.